Palmer B. Coombs, serving with the U.S. Naval Railway Battery #1, was positioned near the tiny village of Champigneulle, France. 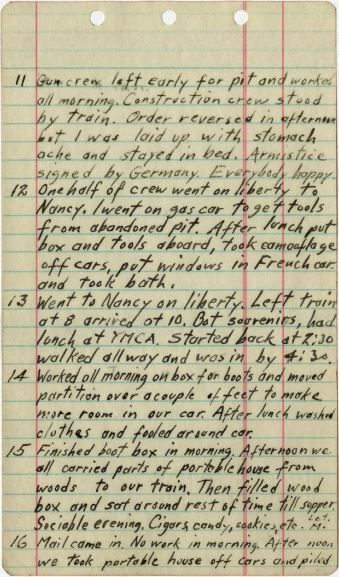 His diary entries describe the last days of the War and on November 11th he ended the entry with “Armistice signed by Germany. Everybody happy.” Coombs remained in France until late December, arriving in New York Harbor on Christmas Day 1918 (they would stay on the ship until December 26). 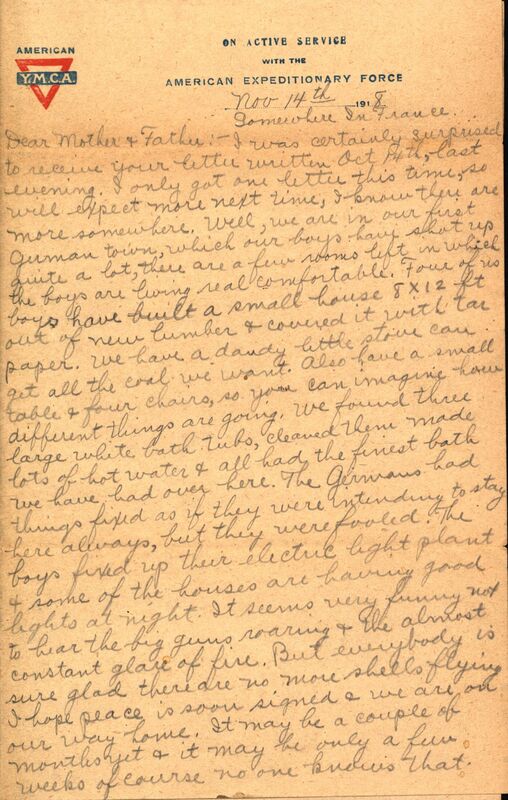 Coombs’ World War I diaries have been digitized and are available on CORE Scholar. 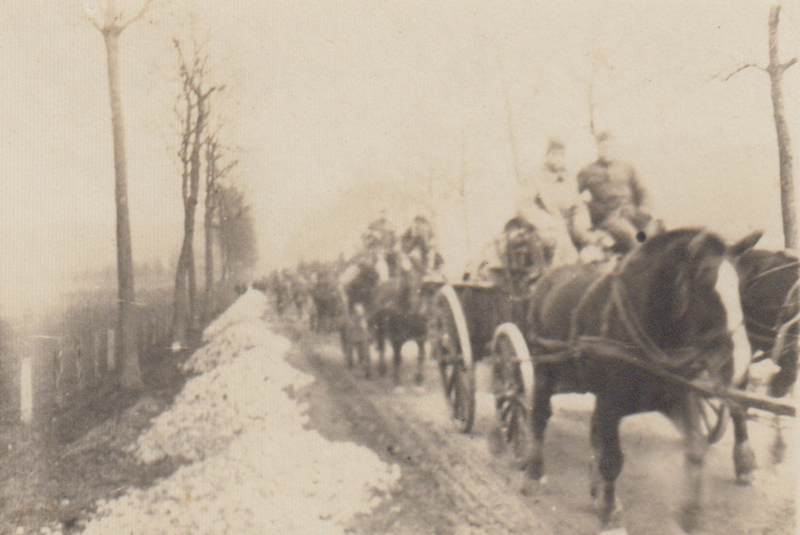 Charles A. Kline, a native of Medway, Ohio, would write his parents on November 14 from “Somewhere in France.” Charles’ unit, Battery D of the 324th Field Artillery, had been involved in the Meuse-Argonne Offensive. It was this Allied offensive, which started in September 1918, that helped bring the war to a close. Kline wrote “it seems very funny not to hear the big guns roaring & the almost constant glare of fire. But everybody is sure glad there are no more shells flying. I hope peace is soon signed & we are on our way home.” Charles would not return home to Ohio until May 1919. Charles Kline to Parents, November 14, 1918, page 1 (MS-342, box 1, file 7). Alice Carr, a Yellow Springs native and nurse with the American Red Cross, actually captured photographs of American soldiers leaving the front after the Armistice was announced. She was among the first Americans who departed for France in June 1917 and would be stationed at Base Hospital 18 in Bazoilles-sur-Meuse. While most Americans eventually returned home, Alice stayed in Europe working for the Red Cross and later the Near East Foundation. More on her life and service here. 200,000 Ohioans served in World War I with 6,500 dying in battle or from disease. Veterans from units like the 322nd Field Artillery would hold annual reunions for many years, and in 1919 President Woodrow Wilson proclaimed November 11 as Armistice Day (it became an official holiday in 1938). 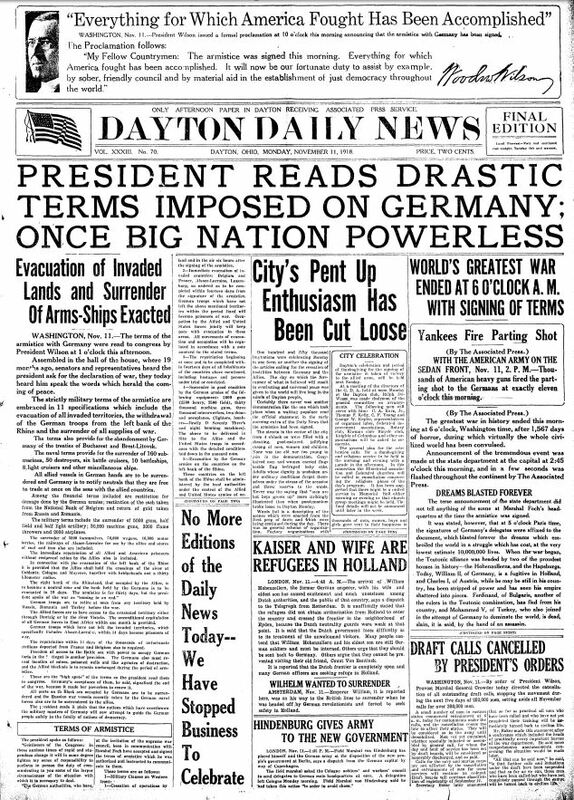 In June 1954, legislation passed to change Armistice Day to Veterans Day to honor American veterans of all wars. This entry was posted in Collections, Dayton Daily News and tagged Alice Carr, Armistice, MS-135, MS-182, ms-342, WWI, WWI100. Bookmark the permalink.